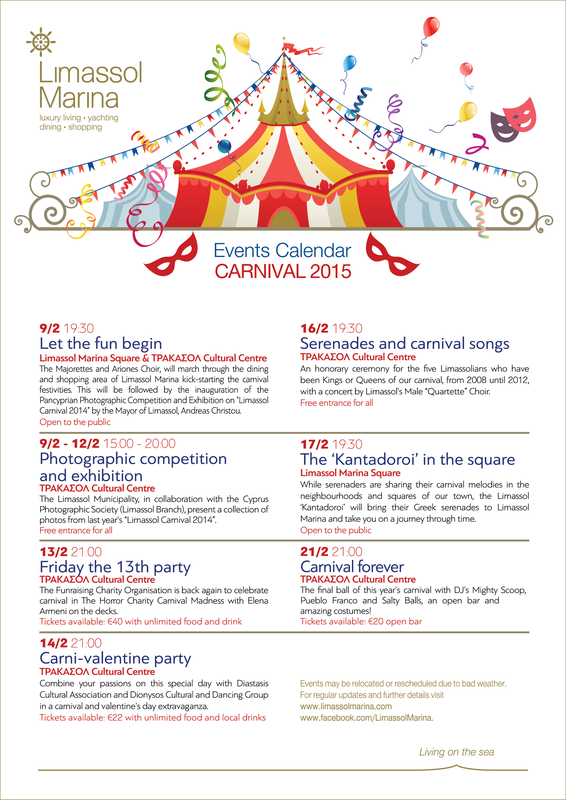 The official carnival programme of the Limassol Municipality is in full swing at Limassol Marina in Cyprus. Currently underway, it is the first time that the Limassol Marina is dressing up for the carnival celebrations, inviting everyone to an entertaining 12-day programme, listing numerous festive events that will enhance the city’s carnival tradition. The official programme of the Limassol Municipality started from Limassol Marina on the 9th of February, with the Majorettes and the Ariones Choir who marched in front of the square, through the dining and shopping area of the Marina. Other events have continued throughout the 12-day period, and the Carnival spirit will culminate with the closing carnival ball on the 21st of February at 21:00, at the ΤΡΑΚΑΣΟΛ Cultural Centre with DJs Mighty Scoop, Pueblo Franco and Salty Balls. It is also worth mentioning that throughout the festivities, the restaurants and shops of Limassol Marina will also join the carnival rhythm, adding more fun and entertainment to the cheerful celebrations. Events may be relocated or rescheduled due to bad weather. For regular updates and further details, visit www.limassolmarina.com, www.facebook.com/LimassolMarina. Click here to view full calendar of events or for more information, visit Limassol Marina.